Change actors like designers play a strategic role in innovation and transition processes towards a sustainable society. They act at all levels of society and need help to find their way through increasingly interrelated innovation systems. To support their efforts, there is a need for a design supportive model that (1) can provide insight into the development of new products and product-service systems, as well as in developments that occur in society as a whole; (2) can provide insight into the relationship between functional problems on the one hand, and more abstract societal problems on the other; (3) describe design processes, change processes and transition processes in a consistent, mutually comparable manner that can potentially be used to structure future design-based initiatives. 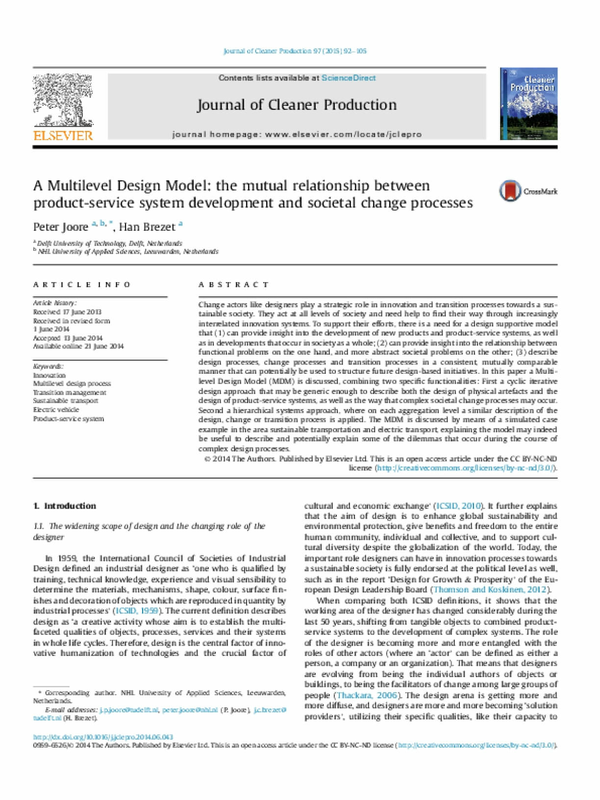 In this paper a Multilevel Design Model (MDM) is discussed, combining two specific functionalities: First a cyclic iterative design approach that may be generic enough to describe both the design of physical artefacts and the design of product-service systems, as well as the way that complex societal change processes may occur. Second a hierarchical systems approach, where on each aggregation level a similar description of the design, change or transition process is applied. The MDM is discussed by means of a simulated case example in the area sustainable transportation and electric transport, explaining the model may indeed be useful to describe and potentially explain some of the dilemmas that occur during the course of complex design processes.